I was personally stunned when I saw this wonderful engagement image of this gorgeous couple. The engagement photography session may not have a nature-packed backdrop with scenic mountain views, but this photo surely grabs your attention. 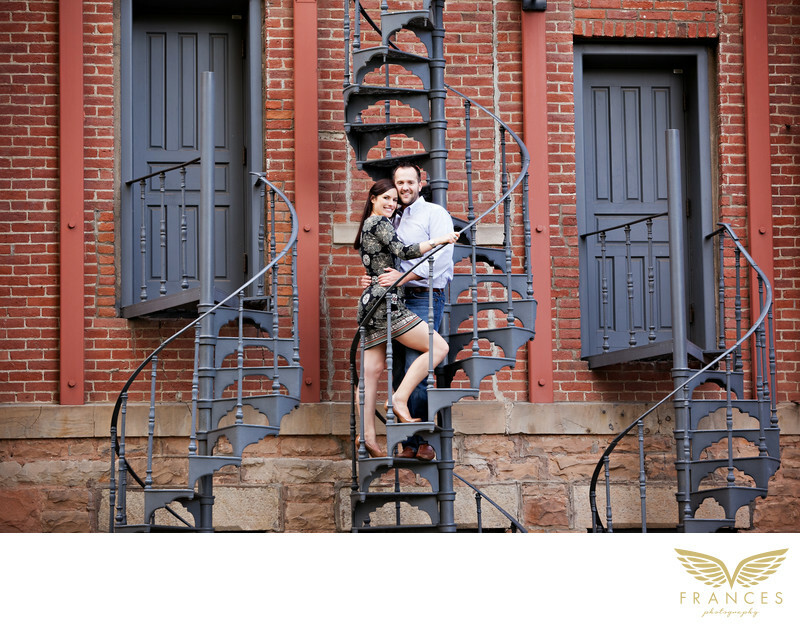 The way the couple was placed in the photo by one of the best engagement photographers Denver has is really outstanding. She was able to utilize the unique beauty of that red building behind the couple to make a great composition for her photo. If we’re all in that same spot, we can’t say that all of us will be able to think of placing the couple right in the middle of those two black doors, elevated in the spiral staircase of these apartment units. That’s why upon gazing at this captivating engagement photo, I could easily say that the photographer who took a shot of this is skilled in her craft and knowledgeable in the aspect of photo composition. You would even mistake this image for an editorial photo to be published in a magazine because the poses of the future bride and groom are also flawless and creative. We can only surmise how delighted the couple was when they saw this photo.